There were 3 girls in my house growing up and as you can imagine -we went through a TON of personal care products. There was the shower full of soaps, 2-in-1 shampoos and Neet hair removal cream (Pert Plus and Dial were my favs), the vanity with a huge assortment of face washes, toners, deodorant, Biore nose strips, toothpaste, hair gels and mouthwash AND our own makeup bags stuffed to overflowing with cosmetics and nail polishes. And I always liked to top things off with a generous spritz of The Body Shop vanilla perfume just to seal the deal. Hey it took a lot of work to look this fabulous! 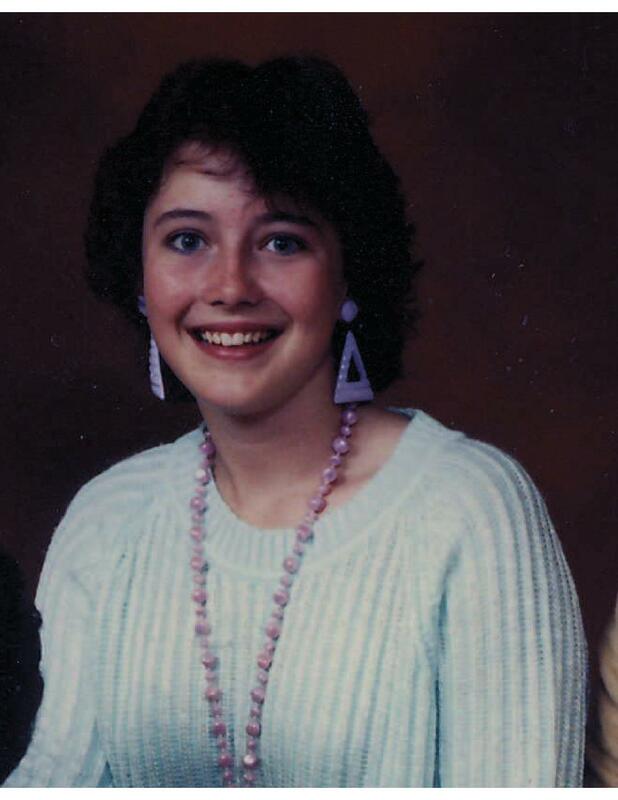 What I didn’t know back then was that each of those items that made my hair shine, my pimples fade and my nails gleam fluorescent purple were loaded with toxic chemicals. In fact, it wasn’t until I set about changing my diet 6 years ago that occurred to me what I put on my body is just as important as what I put into it. Perhaps even more important since the things we eat are filtered through our organs of elimination (kidneys, liver, bowels) but the junk we smear on our skin is simply absorbed right into our bodies. Yeesh! 1. Read Gillian Deacon’s book “There’s Lead in Your Lipstick” – Broadcaster and environmental activist Gillian Deacon wrote this compelling book after undergoing treatment for breast cancer. It’s an invaluable resource because she not only outlines all of the hazardous chemicals and their potential side effects but also lists natural and effective alternatives by brand name. 2. Download the free app “Think Dirty”– Developed by a young Canadian entrepreneur, this free app is a life saver when you are shopping for the healthiest products to use on your body. Simply enter the product or scan the URL and you will immediately get the list of ingredients with a ranking from 1-10 (10 being the worst). The “Dirty Meter” will rate the products ingredients in terms of their Carcinogenicity, Developmental & Reproductive Toxicity and Allergies & Immunotoxicities. And they even offer up greener and more natural alternatives! 4. Order online – Although you might not be able to find good clean products at your local store, there are some amazing websites offering beautiful natural products to keep you looking and smelling your very best. 100% Pure, Living Libations and Gabriel Cosmetics are 3 of my absolute favourites. 5. Make your own stuff- I’ve had lots of fun making beauty products in my own kitchen. Meghan Telpner’s book Undiet and the website WellnessMama.com have tons of wonderful recipes using easy-to-source ingredients like baking soda, epsom salts, avocado, oats and raw chocolate. I even whipped up homemade beauty products to give as Christmas gifts to my girlfriends including these Lavender Bath Salts: Combine 3 tablespoons of epsom salts, 1 tablespoon sea salt, 8 drops of lavender essential oil and 3 tablespoons of baking soda in a small jar. Shake it all up and use generously in a restorative hot bath! 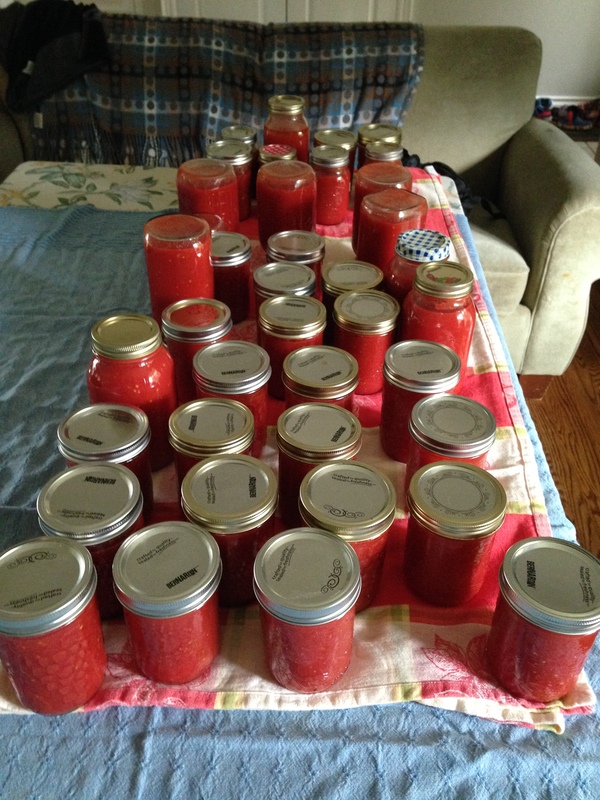 I have always wanted to learn how to make jars of fresh tomato sauce. Each summer when the tomatoes are at their peak, I fantasize about filling my cupboards with the most amazing sauce ever created (yes I am a food nerd). 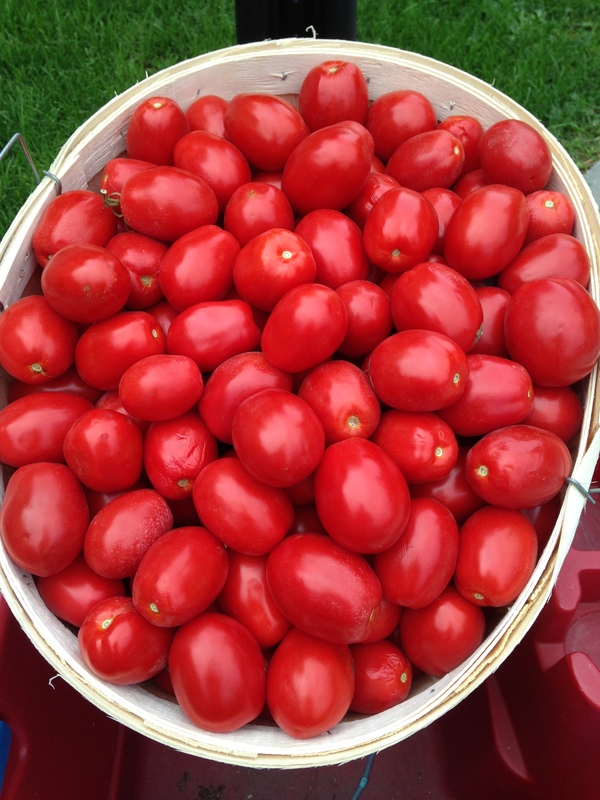 I even went so far as to buy a bushel of tomatoes a few years back and set about peeling, seeding, blanching, chopping and sterilizing….until the whole thing just got so overwhelming that I shoved my half-assed attempt at sauce into bags and popped it all in the freezer. Massive red ice-cube blobs that I eventually thawed and dumped. Pathetic. The biggest stumbling block for me (and it’s the same story for homemade jam btw) is sterilizing the dang jars. Whenever I start reading the instructions for the sterilization process I end up breaking into a cold sweat as I imagine my dinner guests doubled over with acute food poisoning. I just can’t handle the pressure! So you can imagine my delight when I mentioned my tomato-sauce ineptitude to a couple of my closest girlfriends and they said “Hey – it’s not hard at all. We’ve done it lots of times. We can teach you how to make it.” Woohoo! I quickly roped them into committing to a date and anxiously awaited my sauce-making lesson. The day before our cooking extravaganza, one of my girlfriends dropped off a bushel of the most beautiful bright red tomatoes at my door. “Wash them and set them out on a flat surface to dry” she instructed. Looked easy enough until I realized that a bushel of tomatoes is freakin’ heavy! She helped me load them into my son’s wagon and I rolled them gently into the backyard. After an hour scrubbing them and lining them up on a bed sheet outside, I stood back to admire my work (and then promptly hopped into a hot bath to soak my aching back….bending over the hose is tough work). The next day, my friends arrived bright and early armed with boxes of jars, more tomatoes and tons of cooking supplies. 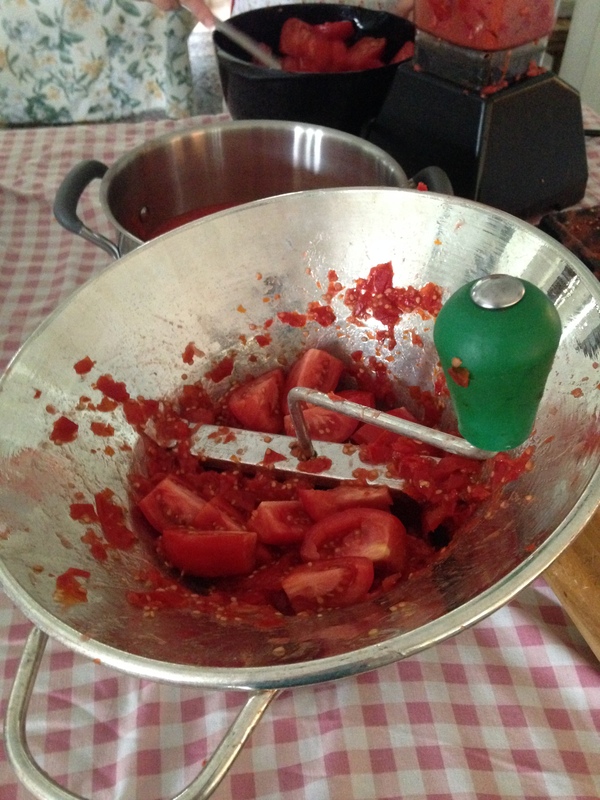 One of the girls had miraculously discovered that chopping and putting the tomatoes right into our high-powered blenders would cut down hours of the tedious work of grinding the tomatoes by hand but I wanted to try one batch the old-school way. The girls just looked at each other and rolled their eyes but indulged me and passed me the tomato grinder. As they happily whirred up the tomatoes in the blender, I hand cranked the chopped tomatoes through a stainless steel grinder. Much more difficult and as it turns out – the sauce from my efforts didn’t taste any different from their blended sauce. After 1 batch, I also switched to the blender method and in no time at all we had a few pots of sauce boiling away on the oven. It turns out that my fear over the jar sterilization was overblown. The girls simply popped the jars into the dishwasher on high heat and placed the lids into a pot of boiling water on the stove. They handled the jars carefully so as not to touch the lip and used tongs to place the lids on each one. Then they set them upside down on a table for a few minutes to make sure they weren’t leaking and turned them over to wait for the “pop” of the lids that indicates a good seal. Voila! – it’s not so hard – just go for it! My wish has come true – my pantry is all stocked up with tomato sauce. Thanks to my friends, I conquered my fear and learned a great new skill. Next stop….jam! 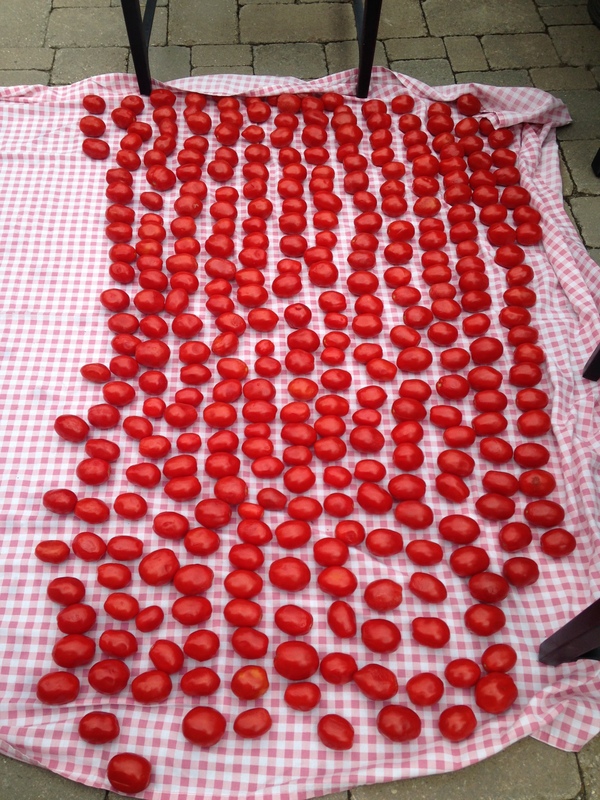 Wash tomatoes and lay them on a flat surface to dry for 24 hours. Sterilize jars on high heat in the dishwasher. 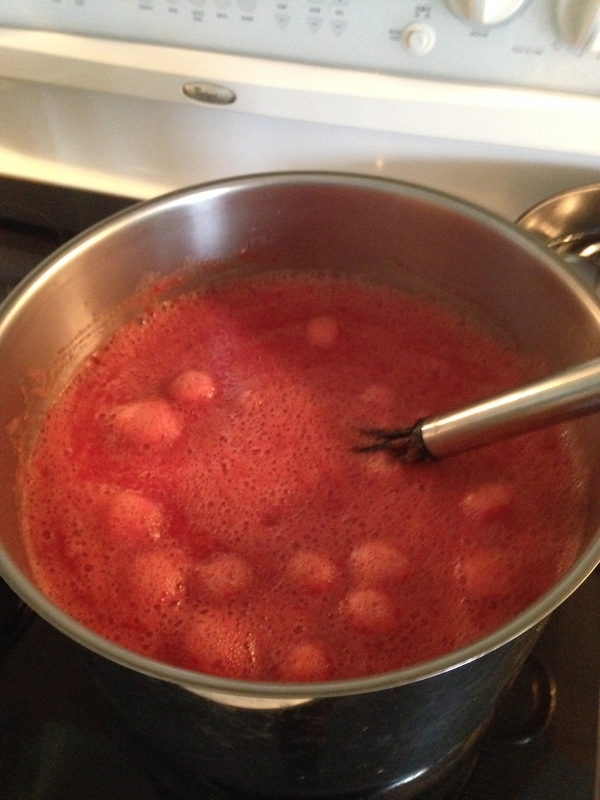 Quarter tomatoes and place them into a high-powered blender. Whir for 1-2 minutes until blended. Place mixture into a large pot on the stove. Bring to a boil and boil continuously for 1 hour, adding sea salt to taste. Place jar lids and rims into a large pot of boiling water on the stove. After 1 hour, scoop sauce into a sterilized jar, leaving at least 1-inch of space at the top of the jar. Use tongs to place a lid on the jar and seal with a rim. Place jar on the table upside down for a minute or 2 to ensure there is no leaking. After a couple of minutes, flip the jar right side up and listen for the “pop” of the lid that will let you know that the jar is properly sealed. *Lori’s Suggestion: When you are ready to eat your sauce – put a tablespoon of olive oil into a skillet and heat on medium-high. Add a minced clove of garlic, a sprinkle of sea salt and a dash of red pepper flakes and cook for 1-2 minutes. Pour in your sauce and heat through. Scoop over hot pasta and enjoy! I first met Barbara Reade and her partner Roman at my Sunday morning bootcamp class and she struck me right away as someone who was friendly and warm but also strong and determined (she completed the Tough Mudder in the spring for heaven’s sake!) When I asked for guest bloggers about a month ago, she was the very first person to step up with an offer to write a piece on her painful, frustrating and enlightening journey back from a knee injury. Judging from the crazy number of backwards lunges I saw her do just this past Sunday in class, I’m fairly certain that she has made a full recovery. But I think you’ll agree that there is much to be learned from Barb’s struggles and observations as she healed her body over the summer and eventually made peace with the process. Every so often, life throws a curve ball in your direction. You can either stealthily duck to avoid it or, if you are less agile and perhaps involved in a sport that involves skillful pivoting in sand while looking skyward for flying balls, you can get hit squarely in the face. Or in the knee, which was sort of my case. In actual fact, I ended up spraining my knee while playing volleyball on the beach with a group of friends who had banded together to form a team for an upcoming fund raiser. The only caveat was that we needed to play beach volleyball convincingly well, so practising was imperative. None of us had so much as picked up a volleyball since our high school days, but we were all keen, overflowing with enthusiasm and ready to have fun. I should mention as well that every single one of us was involved in a number of athletic pursuits already, so we felt that we were ready for the challenge. My initial reaction to injuring my knee, I’m ashamed to say, was embarrassingly immature. Shortly after the practice that cut short my volleyball career, when it was obvious that I had done something really unpleasant to my knee, I had a little tantrum back at home. I was feeling rather sorry for myself, quite hard-done by and blurted out to Roman, my ever patient partner in life, “I don’t even play volleyball!” As if I would feel much better had I injured myself doing something that I participated in all the time. Would I have felt differently if I had been inadvertently kicked in the knee during a boxing class, or if I had wiped out attempting a daring box jump in a small group training class? I mean, heck, I made it through the gruelling training regimen for Tough Mudder when there were literally dozens of ways to get hurt. Yet, in reality, it was an injury that resulted from a sport that I had tried just for fun and to help raise a little money for a good cause. It could have happened to anybody. The day after that fateful twist of my knee, I hobbled off to the chiropractor to confirm what I already suspected; that I did, indeed, have a sprained knee. I was told to ice my knee every few hours and stop my usual physical activities until the knee had a chance to heal. In other words – rest. How lovely. Rest. So why did this one word, which normally conjures up pleasing images of reclining, lounging, napping, and basically draping one’s body over every available piece of furniture for hours on end, send me into an emotional tailspin? I now have indisputable proof that exercise and the pursuit of a healthy lifestyle are non-negotiables. Life is just a whole lot better with wellness at the forefront. The lack thereof, is worse than an injury. I know for sure that I have many wonderful people in my life because of item #1. Without them, I feel like I’m missing limbs. Their support and friendship sustain me. With fewer commitments, I created more time to spend with my elderly parents during the week following my sprain. This was a welcome change, as I had originally planned to spend the final week of my summer holidays tackling as many activities as possible before the launch of another school year. Instead, I met my folks for a leisurely mid-week breakfast, escorted them to a couple of favourite shops, drove Mom home from the hair salon, enjoyed ice-cream with the two of them on a bench, and simply had more time to hang out and chat. For the first time too, I kept pace with my Mom as she walked with her rollator, never feeling like I was going too fast. My slower pace was just right. I’m learning how to overcome my tendency to restlessly relax. I admit it, when I’m “relaxing”, I usually have one eye scanning my surroundings for something else to do. You can’t leap up every few minutes when you’ve got an ice pack positioned just so, and your leg propped up comfortably on a pillow. The battle is not yet won, but I am learning to resist those urges to flit from one activity to the next. You can’t read a great book if you’re perpetually on the move. Suffice it to say, I’ve done a lot of reading recently. As difficult as it has been to miss out on all my favourite activities, it’s good to know that they will still be there for me when I’m ready to return to them. My situation is temporary, not permanent. I’m so very thankful for that. I learned how to remove cat pee from a litter box in order to provide the veterinarian with a urine sample. Really. One day, I may write about it. Maintaining a sense of humour is everything. I’m glad that mine is still intact. As I mentioned earlier, this list continues to grow and I have undoubtedly left out many valuable observations that I will kick myself for later. Speaking of which, I need to get back to resting, icing and healing my knee, so that I can resume all the power walking, lunges, squats, dipping birds, stair runs, boxer shuffles, and yes, kicking, that I have enjoyed so very much. Well, maybe not the dipping birds.